From pancakes and shampoo to children's literature and instant noodles, Rockman's likeness has graced practically every product imaginable. Tonight's featured item of obscurity is no exception. 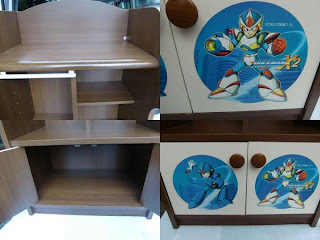 Behold, official Rockman kids' furniture. Manufactured in 1994 by Itoki Design, the set includes a Rockman X2 bookshelf/mini closet and a desk chair. The shelf is said to measure at roughly four feet in height with just enough space for a small set of clothing and some toys, while the chair stands six inches off the ground -- clearly designed for young children, maybe even toddlers. The set appeared on Yahoo Auctions Japan a couple weeks back, but was pulled when the seller chose to keep it for nostalgia sake. Itoki Design is no stranger to Rockman products, it seems. 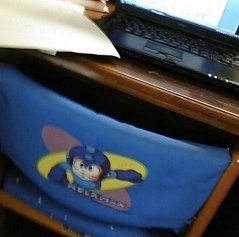 In the past, the company developed a line of Rockman-themed office supplies such as pencils and pens (frequent on Ebay) and even pencil sharpeners. Of course, most of this stuff has been limited to Japan, but the Mega Man brand had its fair share of mass licensing, too: the early 90's had a bunch of Ruby Spears cartoon products and the 2000's yielded quite a bit of NT Warrior merchandise, the latter even had sleep-wear! Just another strange item from Japan. If you happen to come across anything else of equal or greater obscurity, send it my way. The fact that the decoration has that good ol' pre-X3 art style just makes this even cooler <3. Wow, i´d enjoy it if i were a kid. It would be awesome if I were a kid. But, for an adult, it will be silly.